Since the early centuries of Christianity, pilgrims have traced the footsteps of Jesus and other Biblical figures across the Holy Land. More than two million Christian pilgrims visited the historical Palestine in 2012 and the numbers are rising steadily every year. Forbidden Pilgrimage shows how Israel has promoted its control over Palestine amongst Christian communities worldwide as a “heavenly blessing”, while at the same time sealing off or destroying biblical sites and pilgrimage routes held sacred to numerous sects. Ahmad Damen is a Palestinian filmmaker, musician and writer. He holds an MSc in Change Management from Leeds University, but left his job in Marketing to pursue his dreams in films and music. His first feature documentary “The Red Stone” (2012) was an international success and represented Palestine in Istanbul International Film Festival and the Arab Camera Film Festival in Rotterdam. The film was screened in Bristol last year in addition to screenings in London and Boston and was awarded a Special Jury Selection at Toronto Palestine Film Festival in Canada. 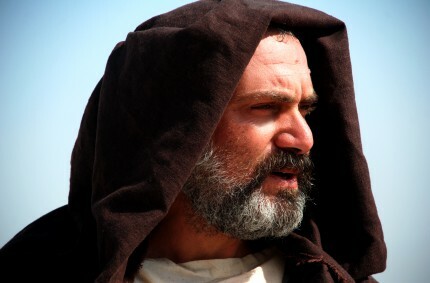 His second film “Forbidden Pilgrimage” (2014) had already an official selection at Aljazeera International Film Festival and also officially selected in festivals in London and Toronto. He’s now working as an editor for a prestigious magazine in Palestine and conducting other personal projects.